(Lamar County, MS) Looking around you wonder how anything is left standing. Very few trees are upright, and even fewer homes on a stretch of Sullivan-Kilrain Road in Lamar County, Mississippi just outside of Hattiesburg. Most of what was here is now scattered across several stretches of property. Residents were told this is where Saturday morning’s tornado touched down and began its path of destruction for fifteen more miles. Melissa Bagett is looking for the hidden treasures of family pictures she might find through the piles of debris left behind. 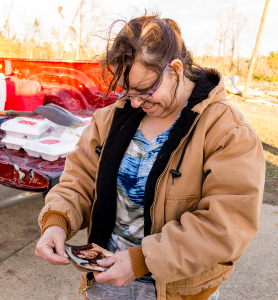 Melissa and her husband Mike were here when the tornado touch down just outside their home. A portion of their roof was ripped off by the storm and vehicles were pushed several feet by the strong winds. Homes up and down this road experienced the same, but all walked away. Now they must rebuild or move like the Bagetts are doing. The Salvation Army was the first service organization to stop by and offer help in the form of meals and a friendly face. “It helps. It tells me the community understands you need sustenance after something like this,” said Mike Bagett. Mike is right when he says community. These are local Salvation Army disaster volunteers from the Hattiesburg Corps dropping off several containers of food. 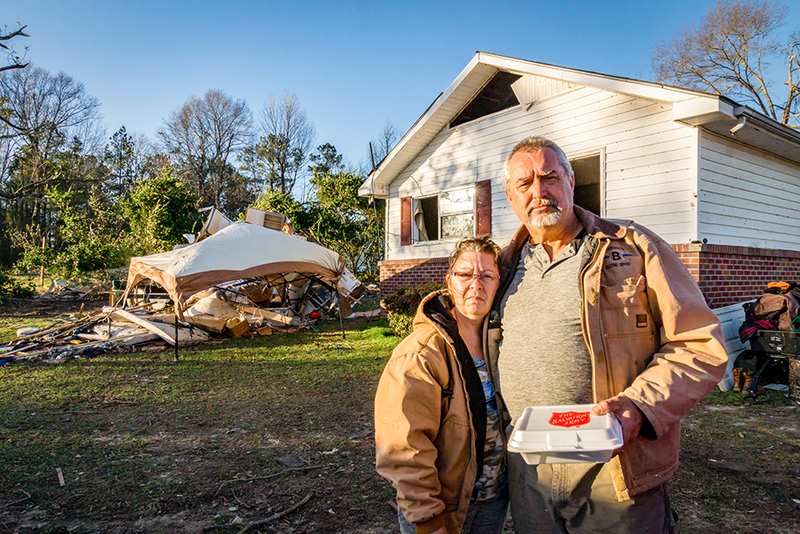 Hattiesburg Corps officers, Captains Patrick and Stacey Connelly have turned their attention to healing those devastated by the storms despite having lost the use of most of their facilities themselves. “We are still in a state of shock, but we had to make sure we took care of the community that supports us,” said Captain Patrick Connelly. Right now, the estimate to getting back in these buildings is six to nine months. For now, a portable office is already set up on the campus. “We knew immediately we needed a game plan to run out social services, our Boys’ and Girls’ Club and to meet needs,” said Captain Stacey Connelly. The best way to help after a disaster is to make a financial donation to the charity of your choice. Monetary contributions also support local economies and ensure that businesses can operate when relief supplies diminish.